Even if you have been blogging for a reasonable amount of time, you can still end up making mistakes that are just staring your readers in the face. You may not give a second thought to your social media icons or your images, but by making a few tweaks, you can vastly improve your blog's user friendliness. Whenever I visit new blogs, I always look out for things that hinder my reading experience there. That's how this list came about, and you'll know what I mean once you read it! 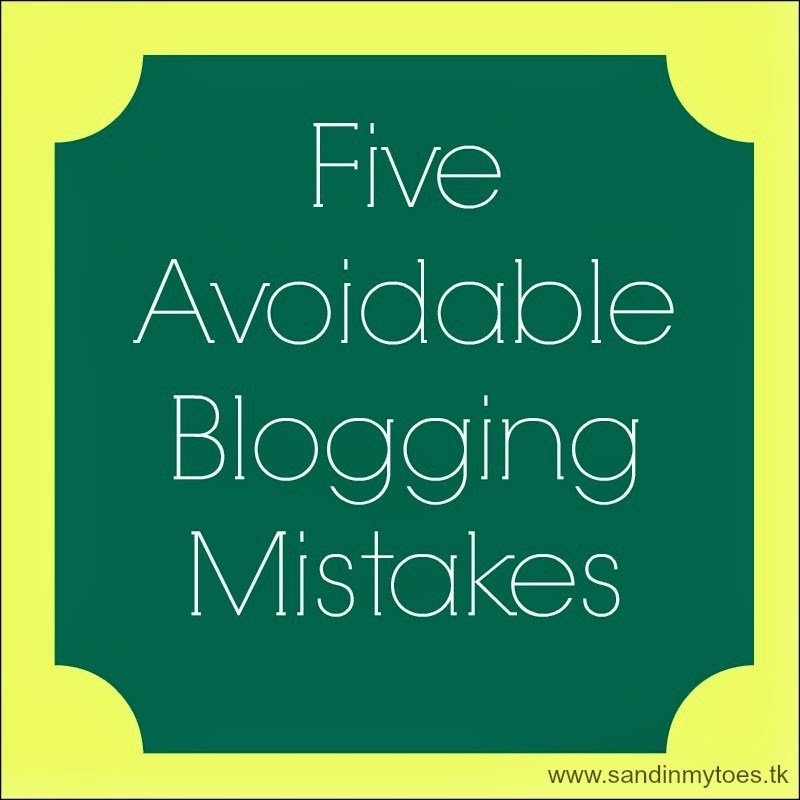 Here are some mistakes that you can avoid making on your blog, starting now. This is a cardinal rule in web design. Whenever you are sending readers away from your site, please have the link open in a new window. It's easy to do that by just adding the target="_blank" attribute to your link (you may be familiar with it, but here's a demo). It's not a bad thing to send readers away from your blog. You may be pointing them to a useful article, or resources related to your topic. You may have a blog roll of favourites you'd like them to visit. More importantly, you probably have social media icons that take them to your Facebook or Twitter profiles. Now, here's the problem: I visit a blog and I like it, so I decide to follow the blogger on Twitter. When I click on the icon, it takes me to their Twitter page, where I follow them and close the window. Having done this, I forget all about exploring more of the new blog I liked. See my point? Make sure your readers always have your blog open in another window so they can linger there for longer and look at more of your content. Have you signed off your introduction with your name? I'll give you a second to check it out... I hope you have, because while it's good to have a face on your blog, please don't forget to add your name! It's a different thing if you don't want to disclose your name for any reason, but I have seen blogs complete with PR sections, but no sign of their names anywhere on the blog. Even if you have mentioned it in your About section, have your name somewhere on the home page - whether next to your picture or in the sign-off to your blog post. I like to leave blog comments using the writer's name, and sometimes I really have to hunt high and low for it! Most blogs do have social sharing buttons, but sometimes they're buried somewhere between the subscription box and related content, or other plugins within the post. It's not enough to have them. Your share buttons should be prominent and invite people to share your post. Isn't that their purpose anyway? When I've made up my mind to share your content, I don't want to spend too much time on looking for the buttons. It's also a good idea to have a floating share bar as well (like on the left here) - it's just impossible to miss! It's common sense to promote all your latest posts on the home page, but you may have a lot of fantastic posts from the past too. So, display your archives or 'Best from this blog' posts clearly. Some readers may be interested in a particular category, so don't forget to have category links on display as well. I have a Featured Posts page for my favourite posts, and a Posts Index where all my posts are archived. Don't underestimate the value of older content! It's not just about making your images Pinterest-worthy (but don't neglect it). All social channels today are geared towards images. The image in your post should identify your blog and the subject instantly. I know that there are some bloggers who are just excellent writers, and don't want to be bothered with all the graphic stuff. They believe that their words should speak for themselves - and they do. But having a good image to go with your writing only makes it travel faster to other readers. It's really not that difficult - just add the title of your post (and blog name) in PicMonkey or Photoshop, and you're done! Check out my Tips for a Perfect Blog Graphic for more on making your images eye-catching. I'm going to add another tip, which may sound redundant, but I'll say it anyway: For the love of blogging, don't use Captcha! It's a useless thing which only discourages people to comment. I see far too many blogs still using it, even though word has travelled about the universal hatred for it. Sometimes, the smallest changes can mean a big difference to your blog, so don't let little mistakes bog you down. You can also check out a list of 14 things that drive your readers away, wisdom directly from other bloggers! Nice post! I agree with all the points you have made, I have come across such blogs where names are missing and even picture of the blogger is some weird article! Glad to have discovered your blog, would like to explore more. Thank you, glad you liked the tips! I need to update my About section. Thanks for this! Thank you for the great tips, Tanara. I started in November and I'm always looking for improvement with so much more to learn. I need to tweak it quite a bit. Some really useful tips Tarana. And I agree with you that captcha comments drive me crazy - especially the ones where it doesn't work the first time. Me too, that's why I needed to reiterate the point. Good points, Tarana. I need to find some time to do some updating on my blog. I'll keep these points in mind when I do. I agree with all of these! I'm no fan of captcha, and hard-to-find social media icons is one of my pet peeves! Thanks for these great tips. I've been blogging a few years but they still came in handy, for example, I've just installed a floating share bar after seeing yours! I don't know why but I was under the impression I couldn't have one because I was on Blogger but it was really easy to install and I love it! Good to know you found my tips useful!